Kitchen spotlight on a Friday? What's going on you ask? Well I was so excited about doing a guest post with one of my bestest friends that I couldn't wait until Wednesday to share with you. That, and I'll be getting my wisdom teeth out, and nobody wants to be reading what I have to say when I'm on drugs. That's just probably never a good thing! So without further adue take it away Suzzie! Paige is one of my best friends, ever. She was with me the day I met my husband, and kinda makes a great wing woman, and a great roommate, and a great person to know when you need someone to make you laugh about ten hundred and two random things. So, since she blogs a lot, and I blog sporadically at best, I thought it might be fun to do a little swap and share the recipes we are excited about this spring. Turns out we both love cupcakes, and lemonade. I guess if you live together for any amount of time your brains start to think the same. You can see her recipe on my blog here! 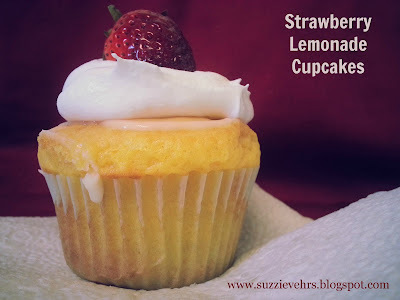 Okay, you caught me, these are only strawberry lemonade cupcakes because there is a strawberry on top. Other than that, they are lemonade cupcakes. Delicious nonetheless. The best thing about these cupcakes is they are made with pudding. Which is awesome because they get more moist with time. At least reasonable amounts of time. I don't really know what happens after three days because they are always gone by then. 1. Preheat oven to 350, put liners in cupcake pan. 3. Fill cupcake liners 3/4 of the way full and bake for 19-21 minutes. 4. While cooking, melt butter and mix the glaze ingredients together. 5. When cupcakes come out of the oven, remove and put on a plate or something that can get a little messy. Poke holes in the cupcakes with a toothpick and gently add the glaze. 6. Top with whip cream and strawberries right before serving. I hope you enjoy this spring treat. What else are you planning on making this season? I can't wait to try Paige's blueberry parfait. Oh how life gets better when berries are on sale. Thanks for sharing your delicious goodness with us today Suzzie! Be sure to go over and catch some more of Suzzie's delicious treats, awesome nail wraps, and more, all of which can be found on her blog, here! Oh, did I fail to mention that Suzzie sells these AWESOME Jamberry nail shields that adhere to your nails easily and flawlessly and cost half the price of a mani? And they're awesome! These are just some of the ones I've been crushing on lately! Click on each one to be taken to where you can get your hands on some of these, or I guess to where you can get these on some of your hands!